Jaguar did an awful lot of things very, very right with the new Jaguar F-Type. It looks fantastic, it sounds like the devil's own V8-powered sexbot, and is both surprisingly easy and rewarding to drive. My only complaints about the car come from a perverse desire to see something with just a bit more wrong in it. By 'wrong' I mean a certain willingness to go a bit farther with certain things than rationality would dictate, and the only reason I even think that is because of the car's predecessor 40 years ago, the E-Type. You can't help but compare the F-Type to the E-Type, despite Jaguar's insistence that the car is not simply an update of the ancestor. When I look at an E-Type, what I feel goes beyond just appreciating the car's beauty — it's a visceral feeling you get deep in your gut that feels like something between raw, humid desire and the effects of eating a burrito you found wedged in your dashboard. The reason the E-Type does this to me is because it takes all those classic sports car traits and just pushes them right to — and a hair beyond — their sensible limit. The hood is almost too long, the rear is almost too tapered and sharp, the bulges almost feel obscene, there were insane V12 engines, everything was a wonderfully almost too much. The F-Type, while it is certainly a very lovely car, is also a rational, carefully-engineered car. Modern competition and regulations means it pretty much has to be. As dramatic and amazing as the old E-Type was, by modern standards it's a pedestrian-crippling murder machine. That's not to say the F-Type is without its share of drama. It has plenty of that, lots of great little bits of entertaining theater engineered in, like how the HVAC vents raise and lower out of the dash at will, or how there's still a clamshell hood, or the way the instruments go through a "flight check" procedure when you start up the car. The F-Type was designed with the Porsche 911 as its target competitor. I'm not entirely sure how much sense this makes, as I feel the 911 has a pretty dedicated group for whom nothing but a 911 will satisfy, and a Jaguar has a very different sort of personality. Still, that does mean that Jaguar spent a lot of time making sure the car drives as well as it looks. I spent a lot of time in the F-Type. Most press event drives cover maybe 50, 75 miles or so — this drive was 270 miles, with me as both driver and passenger, on the highway, windy mountain roads, and track. It's an impressive car, and I think a worthy adversary to the current expensive but sub-supercar lineup. First off, I want to say I really liked talking to Wayne Burgess, lead designer of the F-Type. He was very engaging and willing to discuss all manner of ridiculous cars. But what may have impressed me most was that this was the man who designed the modernized London cab, the TX-1. That's some range right there. 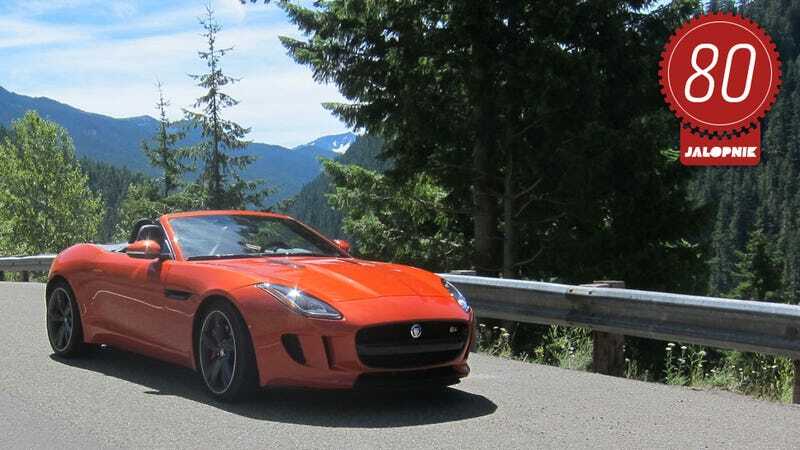 The F-Type is a lovely car, with classic front-engine sports car proportions (long hood, short deck) and a nice selection of updated references and callbacks to earlier Jaguar design without ever becoming derivative or cloyingly retro. From the side, there's two main lines that define the car, the long graceful arc of the front hood and then the shorter, pert curve that defines the rear haunches. It's clean, sleek, and has a lot of the elegance we expect from a Jag. There's minimal surface detailing or jewelry, with even the door handles modestly hiding themselves away when not in use. There's a single side vent (fake) and aside from the wraparound taillights, that's about it. It's pretty understated. The rear has those great huge exhausts (2 central on the V6, a pair on each side for the V8) and the taillights are really nicely done, hinting at the off-the-shelf Lucas units of the original E-Type. The distinctive lower shape of them illuminates in a little red outline, which is fun. Up front we have the already discussed hidden TIE-fighter lights, and Jag's new family grille. They made a big point of explaining why they didn't go for a more traditional oval, feeling that brand identity was more important, because apparently people don't recognize Jaguars on the road as much as they'd like. There's also a set of brake-cooling intakes that they said referenced sharks, which isn't really surprising. All sports car designers secretly want to drive a shark. My complaints about the look are what I mentioned earlier — I'd like to have seen it exaggerated just a bit more. From a distance, it could be almost mistaken for a BMW Z4, and that shouldn't happen. I'd have liked to have seen the curves just a bit more prominent, the proportions just a bit more outside the norm. Even with that complaint, it's a great looking car. I bet the hardtop they can't officially say is coming will look even better, too. A 10? It might just be. Thanks to the long drive, I got to spend a lot of time in the F-Type. It was closer to a road trip than a press drive at points, so I had a good mix of being a driver, passenger, and even a sleeping passenger at times. Perhaps a sleeping driver, too at one point? I hope not. Jag says they like to think of the F-Type as a "1+1" instead of a two seater, referencing the very driver-focused nature of the cockpit and the inspiration of the single-cockpit racing Jags of the past. To that end, they've really separated the driver and passenger with a swooping grab handle thing that divides the cabin just to the passenger's side of the shifter. While this does give the driver a nice cocoon to work in and the passenger a cozy little pod to be installed in, it will limit the amount of getting in on in this car to some furtive, awkward grabbings and open up the danger of gearshifts in sensitive crannies. The quality of the interior materials is absolutely top-notch. It's like being inside an expensive purse, with pretty much every surface stitched up in leather. There's hardly any bare plastics to complain about at all, and the plastics that are there are high quality. There's some little attentions to detail I really appreciate as well, like in the climate control knobs. There's a single adjustment knob for each passenger to set the temperature (push to set seat temp) and the display on it is a very nice multi-segmented VFD thing. They could have just used the 7-segment numbers that most cars would use for this, digital watch or calculator-style. Those work fine. But instead they chose a much more refined system that looks like it came off a Eurorail schedule board, and the result is really satisfying numbers that fit well with the look of the car. A detail, sure, but those add up. They did a lot to get across the concept of the car as "alive" as well, which is a big Jaguar theme right now: the vents that raise up out of the dash (they say it's to keep the sightline over the dash low, but it's really just for added drama), or how the controls don't display labels until you turn the car on and they all flash into place. The seat controls are great as well, if in a somewhat unexpected location. You have the buttons-in-seat-schematic form like many cars, but it's high on the door here, and there's even a little rotary knob to adjust how much side bolstering you get. You can make it grip you pretty tight, and in that way it's sort of like an integrated Temple Grandin Hug Machine. You sit really, really low in the car, and that was intentional, but to Jag's credit, even a short, stubby guy like me could still adjust the seat enough to be comfortable to drive, ride, or sleep. I'm taking off points because of the timidity of the color palette. Sure, the British Racing Green car has nice tan panels, and there's orange stitching on the orange car, but there's still too much sea-of-black going on, and I'm just sick of all that black and grey in car interiors. This car can certainly pull off some more interesting color options. Also on the downside is the trunk. Looking at the trunk is like looking at the aftermath of the Battle Of Getting Some Space In Here. It's an oddly irregular volume of narrow passages, tight corners, and a deep well. This is because to get to the ideal 50/50 weight distribution of the car (with a "European driver" — read "not a fatass American") lots had to go into the trunk: the windshield washer resovoir, the battery and yet another battery for the start/stop system. They claim there's as much room in there as a 911's trunk, though a 911 also has the otherwise-unused back seat area. You'll be traveling light. The F-Type is quick. The V8 S version will go from loitering to 60 in 4.2 seconds, and the best of the two V6s does it in 4.8, with the base V6 coming in at a respectable 5.1. On the highway, passing cars on a two-lane road was a satisfying treat instead of the slightly dangerous chore it usually is. Acceleration in the 495 HP V8 from, say, 70 to 110 is terrific, with a strong, unrelenting feeling of building force. The V6 is no slouch, either, though it just doesn't have the animalistic grunt of the 8. Still, overall, I think I prefer the supercharged V6 because those 380 (for the S, 340 for the base) horses really are plenty to have fun with, and that fun does come at speeds less likely to limit your wardrobe choices to orange jumpsuits. The F-Type has the biggest brakes ever put on a production Jaguar, I’m told, at 15 inches up front and 14.8 in rear, for the V8 version. On the track in the V6, my cunning lack of skill and track-sloppiness allowed me ample opportunity to work the brakes nice and hard, and I found them to be potent and highly controllable. Coming off the straight at 110-120 MPH and braking at 90% force before the upcoming turn gave a firm, predictable, steady feeling of speed being magically turned into heat. The pedal feel is firm and smooth, and the overall result gives a lot of confidence. I was impressed with how comfortable they managed to make the F-Type when it wasn't being pushed hard. The suspension adjusts dynamically, and when driving along leisurely, the ride's not punishing at all. Bumps are well-damped, there's minimal body roll, your passenger can have a nap, even with the top down. You can drive it for hours and not feel like you've spent time miniaturized and crawling through a running sewing machine. Over bumpy, undulating pavement, I did find the car could get a bit pitchy, which is likely the effect of the short wheelbase. On some stretches of particularly wrinkly road the car did feel a bit like a canoe in a storm, but I think those situations are pretty uncommon. The big news here is that the steering assist for the F-Type is hydraulic, not electric, which makes it an increasing rarity in this modern-crazy-go-nuts age. The engineers pretty much admitted this would likely be the last Jaguar made with such a system as well, but they felt that the feel of electric assists just wasn't quite there yet. And, after feeling the steering of the F-Type, I see the point. Electric assist has come really far in the past few years, and generally I think it's quite good now, but old-school hydraulics do have a subtle but noticeable difference in feel. There's just the right amount of weight and this slight, almost imperceptible "give" of the resistance that's hard to describe, exactly, but you can tell when you feel it. It's that analog quality I always deride in intense audiophiles, and then become a hypocrite as I talk about essentially the same thing here. I don't think I'm imagining it, because the steering feels very good on the car. Quick, precise, but not "digital" and with the weight increased in full performance or dynamic or whatever they call it mode, has nice feedback. Flipping the little aircraft-inspired switch into that performance or sport or dynamic mode does a number of things: changes throttle response, ups the RPM limit for the gears, stiffens the suspension, quickens the turning ratio, and each parameter is individually adjustable, if you really want to dig through some menus. I took the V6 on the track and the autocross course on the advice of the pros, who felt that the lighter weight made the car more nimble and a better all-around performer, even with the sacrifice of some straightaway speed. On the very technical track at Ridge Motorsports Park, the trait that stuck with me the most about the car is how forgiving it is. I'd never been on that track before, and my sucking at performance driving is still pretty impressive, so I made my share of mistakes as I pushed it around the track. I overcorrected at speed at least a few times and felt the back end break a little free, but the process of getting things back in control felt natural and surprisingly easy. With a 50/50 weight balance, short wheelbase, and wheels near the corners, the F-Type has the elements lots of drivers will love. Well, maybe not "lots" because the average person who buys one of these is statistically pretty unlikely to ever take it on a track, and that's a shame. I'm going to feel like the most predictable, stereotyped cliché saying this, but I did find myself wanting a pure manual for this car. That's not to say there's anything wrong with the ZF-sourced 8-speed sequential gearbox in the car. It shifts quickly, and seems to make good decisions about when to shift. The paddles are well-located, and using them is pretty intuitive, and the gear changes are rapid manually as well. So while I can't really complain about how the transmission does its job, I can say that the character of the car would be well-served with a nice 6-speed manual. I found my foot and hands reaching for phantom pedals and knobs, just because it felt right. I'm pretty sure a manual would actually degrade the performance characteristics of the car, but the decision isn't really a rational one. It's just a feel sort of thing. My main complaint about the setup is more minor, but no less annoying. Jag was clearly trying to rethink the usual gearshift, and came up with some ideas that sound great on a computer's LCD screen but just don't feel right in practice. To get into park, for example, you push a little button on the gearshift. As many times as I did that, I kept finding myself wanted to push the stick all the way forward, like in every other automatic in the known world. And there was a little trigger system for going into reverse, and I think releasing park that somehow always seemed to confound me for a moment — plus the indicator of what gear you're actually in isn't done by mechanical position, but by a little green LED on the stick. I get that it's advanced and all, but it feels like needless over-complication. There’s the usual assortment of toys in the F-Type: a pair of full-color LCD screens, backup camera, the ability to control all sorts of performance characteristics individually, start/stop, all that stuff we’ve come to expect. There’s also a nice set of stuff just for theater, like the raising/lowering air vents and the door handles that get excited and pop out when you arrive. My favorite is how when you toggle the fighter-jet inspired switch to go into sport/performance/whatever mode all the instrument lights turn this menacing blood red, making your passenger likely wonder just what the hell they’ve gotten themselves into. It’s fun. Jaguar expects that half the F-Types sold will be V8s. And I’m pretty sure the reason behind every one of those $25,000 decisions will be the sound. That sound is like a Pavlovian bell designed to make people cough up tens of thousands of dollars, and when you hear it, you can’t blame them. What’s even more fun is that you can choose when you want to make the glorious racket, thanks to a little button on the center console that looks like a pair of binoculars or WALL-E’s eyes. Pushing that button opens a little electronically-operated valve in the rear section of the exhaust that makes the pipes essentially open, improving performance, sure, but it’s really all about the noise. The V8’s sound is gruff and loud, with rumbles and kidney-stone-crushing roars and terrific burbles and belches when you let off the throttle at speed. The V6 has a good sound as well, but it’s quite different and just can’t compete with the big V8 rumble. There’s a high-end audio system in there as well, but to be honest, I wasn’t ever tempted to even try it. I’m sure it’s great. From a lack of sound perspective, the padded, multi-layer glass window’d top does a good job of keeping out road noise, even at highway speeds. With the top down, as god intended, there is a fair amount of road and wind noise. That’s not shocking when you think about your head moving through the air at 70+ MPH, but it does make conversation a bit labored. This one is a bit tricky, since I’d subtract an entire point for the V8 version. The base V6 starts at $69,000, and I think at that level the F-Type is a pretty good value. The extra 40 horses to go to the V6 S will cost you about $11,000 more, and going to the V8 will set you back $92,000. The one I tested was over $109,000, and while not supercar money, that’s a big pile of cash. I think the real value sweet spot here is the V6, but personally I’d really love to see a stripper version of the F-Type with Jaguar’s nice 2L turbo 4. Put a conventional manual transmission in something like that and take out the motorized vents and door handles, get rid of a lot of that leather wrapping and the heavy, trunk-eating start/stop system, and sell it for $45K - $50K and Jaguar would have a terrific upscale Miata or Boxter fighter. I think it would be incredible. The engineers and designers liked the idea, saying they’d consider it, but it, of course, would have to make money. They’ve gotta keep supporting Tata so they can make those Nanos, after all. One little unusual thing that happened was the check engine light turned on in V8 I was driving. The engineer told me it was probably nothing (if people just did everything I ever said, we’d know for sure) and I’m sure he’s right. Still, I’ve never had that happen on a press drive before. Maybe it’s a little Lucas Electrics easter egg tribute. I came away from my long drive in the F-Type very impressed with the car. It has a solid mix of easy driving and genuine performance potential, wrapped in a striking body and making all the right noises. I’d say record the V8 audio on your phone and listen to it several times a day, but buy one of the V6s.